It is on the pavement, and between a kindergarten and a nursery school. Even if you are exposed to 2.7 uSv/h for 8 hours a day, the total annual dose is “only” 14.2 mSv. Their new “safety” limit is 20 mSv. 14.2 mSv is less than 20 mSv ,so it is not harmful at all. As a matter of fact, nobody has ever voted for the 20 mSv/y policy. Mr. Koide assumes that 80 in 10,000 people will die of 20 mSv/y policy. If the death rate of cancer is 10%, there will be 800 people have cancer in 10,000. If the rate of cancer is 25%, there will be 3,200 people will be sick (but not diagnosed as cancer) in 10,000. This is almost the same rate as hey fever. 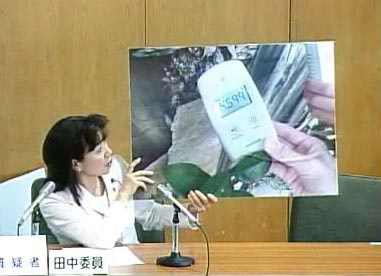 Some people suggest it might be ash from the Tokyo south sludge plant in Ohta ku, where burn highly radioactive sludge. Prof. Hirotada Ohashi, One Of The ‘Plutonium Brothers’, Was A TEPCO Employee!